WASHINGTON (May 10, 2007) -- For 27 years now, a 100-foot metal giant has struggled to escape the ground at the end of East Potomac Park, also called Hains Point, in Washington, D.C. He just may accomplish that goal this summer -- only to be buried again four miles south as part of the National Harbor Project in Prince George's County, Md. 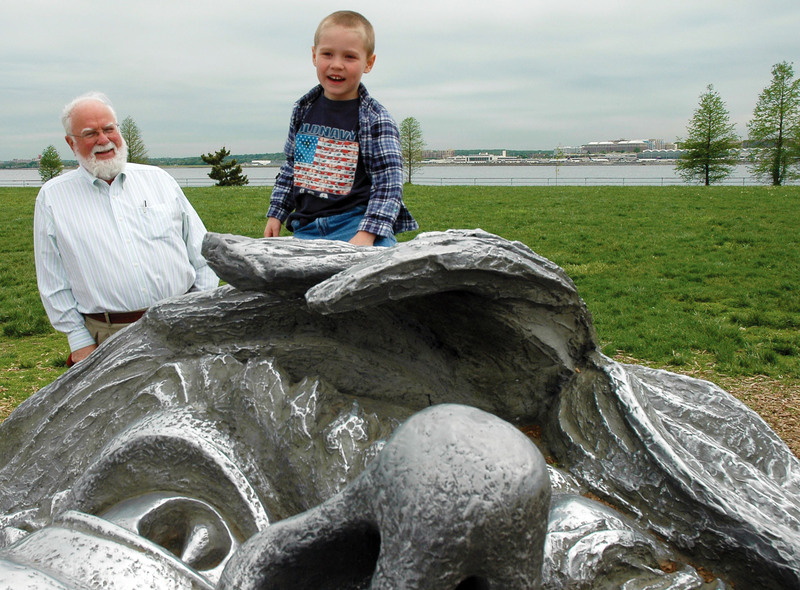 Bob Curry and grandson Rowan Langston visited Hains Point in Washington, D.C., to see the giant metal statue known as "The Awakening." 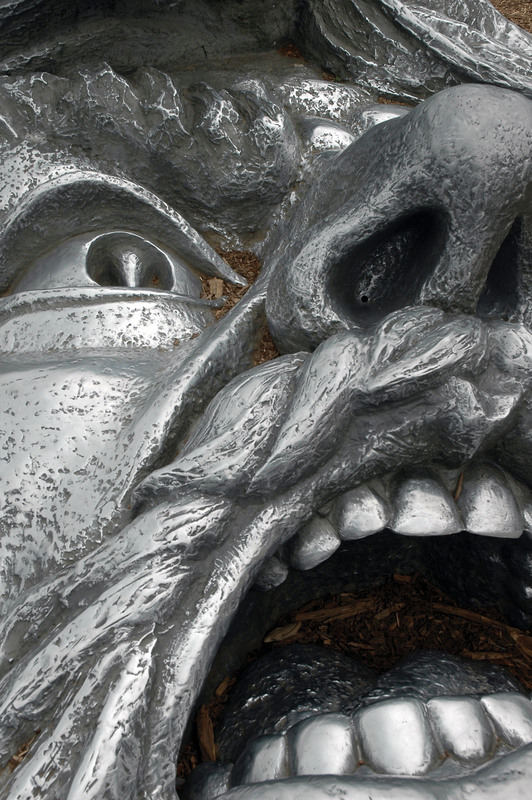 The metal giant, more commonly known as the statue "The Awakening," by American sculptor J. Seward Johnson, has been on display at Hains Point since March 1980. The installation there features five separate pieces, arranged to give the appearance of a 100-foot giant man, who has been buried, waking from his sleep and struggling to escape from the ground. The statue was initially placed there, on National Park Service land, on a temporary basis. But it has become an attraction for tourists and locals alike since it first arrived. "I've brought visitors from out of town, and they just have a wonderful time here, playing on this statue," said Bob Curry, a Springfield, Va., resident, who has been in the D.C., area since 1961. "It's really a marvelous piece of work. This is a great place for a busload of kids to scream and yell and carry on. It's also startling to look at, the first time you see it." Curry brought his grandson, Rowan Langston, to see the statue. It was the boy's second visit to Hains Point. Rowan said the best part of visiting the statue is "climbing on his head." Curry also said Hains Point, in general, is a great place for family gatherings and picnics. "We come down here to watch the river when it comes up," he said. "In the summer time, we also picnic here. It's nice to have a picnic here, and you almost always meet folks from out of town. I like this place because there is a freedom about it, and you don't have to wait in line." The statue proves popular with adults and children alike. Children often climb the giant's bended knee and slide down its leg. Others attempt to climb its 17-foot arm. In just a few months, however, it is expected the statue will be removed from National Park Service land and moved down river to a commercial site in Prince George's County, Md. The statue was sold for $750,000 to the developer of a shopping, dining, hotel, residential and office space complex on the Potomac River. While the statue has been a great attraction at Hains Point for many years now, it was never actually owned by the National Park Service, said Bill Line, spokesman for the National Park Service in the Washington Metropolitan area. "The bottom line is, the 'Awakening' sculpture, as everybody has come to know it, was never the property of the National Park Service," he said. "Seward Johnson had an agreement with park services. We would be the caretaker of it. But he has owned it, with the understanding that if he sold it, he could do so. It was only a matter of when." 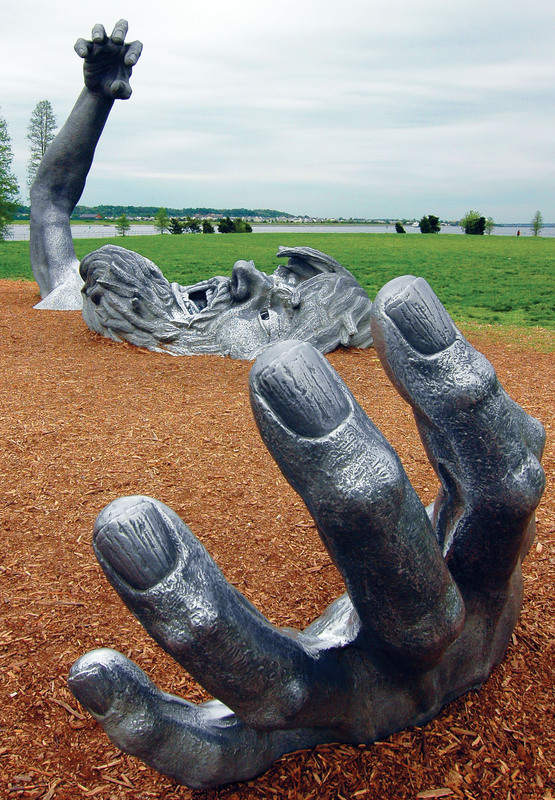 This metal giant, known as “The Awakening,“ by American sculptor J. Seward Johnson, is located at Hains Point, in Washington, D.C. The statue will likely be moved this summer as part of the National Harbor Project in Prince George's County, Md. This summer, the five-piece statue will be moved down river to its new location. But while the statue may be gone, plenty of recreational opportunities will remain at Hains Point, Line said. "Where do I start?" Line asked. "There's all different variety of things to do there." Line said competitive bicyclists use the park daily for training, because it is relatively flat. Inline skaters also find the park popular, he said, as do those who fly kites. Hains Point also houses an outdoor Olympic sized swimming pool, an 18-hole golf course, a miniature golf course and 32 tennis courts -- 16 of which are indoors. "Many members of Congress play there," Line added. The park is also a popular place for such things as family reunions and wedding photos. From Hains Point, visitors can see Bolling Air Force Base, Reagan National Airport, and the National War College on Fort McNair. Hains Point is also a good alternative, in the spring, for viewing the cherry blossoms, Line said. "We purposefully direct people off of the Tidal Basin, because it is so jam packed with people," Line said. "We want them to see the cherry blossoms, but there are 1,800 cherry trees that literally line Ohio Drive, the entire way of Hains Point." The park is also a good spot for fisherman, Line added. "On a daily basis, unless it freezes over, plenty of people are fishing down there," he said. Fishermen regularly line the perimeter of the park, fishing for rockfish, herring, catfish or bass. Todd Lee, a welder for the city of Washington, D.C., goes out to Hains Point three times a month for the fishing. "I've been fishing here for about 15 years now," he said. "It's relaxing, for real. Mainly I get catfish and rockfish. But right now it's rockfish season. There's also herring. They're pretty good too. I get them for my father. You get them and salt them down." The rockfish and herring are spawning now, Lee said, and that increases the number of fish available in the water. "The rockfish just come through to spawn," he said. "If you stand around you'll see two or three hundred come through. You'll see big schools of them. But after that, I probably won't be back to next March." Lee cleans the fish he catches right there at river's edge, because, he said, he doesn't have the luxury of time when he gets back home. "Once I get home, I have a big 'honey do' list, so I usually clean them here," he said." He also said the herring can be used as bait for other fish. "That's what the big rockfish like." Hains Point is open 24-hours a day. So Line said the park also sees a fair share of couples on dates, who want to enjoy the view the park affords of the surrounding area. "There's a lot of couples down there smooching," Line said. "But people in government, who work long hours, also go down there many times in the evening." While the statue "The Awakening" will be moving soon, the park site is already approved by Congress to hold a memorial of some sort, Line said, though nothing yet is planned. Hains Point, and "The Awakening," can be reached by traveling south on I-395, and taking the Ohio Dr. exit, the first exit after crossing the Francis Case Memorial Bridge. The statue is located at the end of the park.